Seeking Aircraft for Sale Near Reno or Lake Tahoe? HomeblogRenting AircraftSeeking Aircraft for Sale Near Reno or Lake Tahoe? If you’re looking for an aircraft for sale near Reno or Lake Tahoe, consider joining a flying club instead. Many pilots searching for aircraft for sale near Reno have never even thought about joining a flying club, but pilots living in Lake Tahoe and Western Nevada now have access to one of the most affordable flying clubs in general aviation. 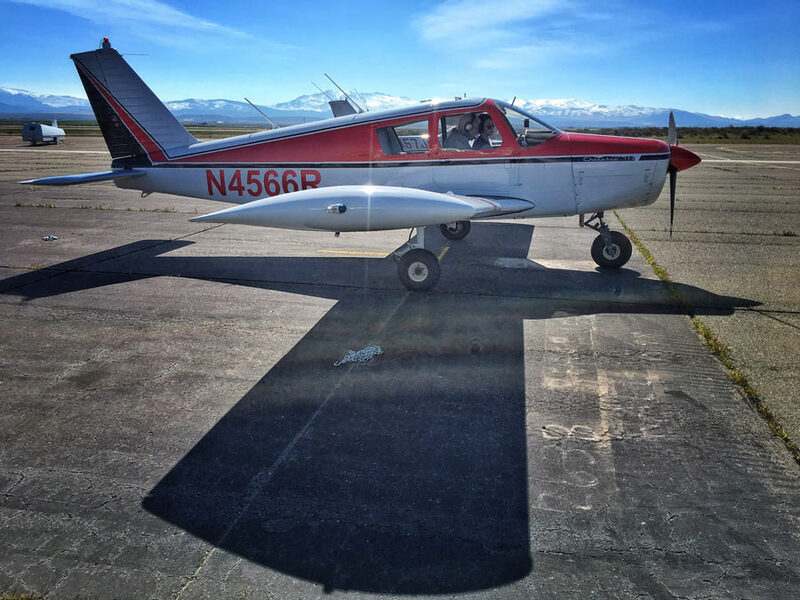 Starting in 2016, the High Sierra Pilots Flying Club at Minden-Tahoe Airport has been providing pilots and student pilots access to a gorgeous, upgraded Piper Cherokee (you can read about this Cherokee’s restoration process here) for as low as $20 an hour to fill their need for a personal airplane or student pilot trainer. Many pilots set out with the intention of eventually owning their own airplane, and many pilots eventually do, only to find out they can’t afford the annual cost of owning, hangaring, insuring, operating, and maintaining an airplane on their own. Many poor airplanes end up either sold or wasting away chained to the tarmac, and the pilot ends up hanging up their wings and in a pile of debt. Purchasing a used Piper Cherokee with a 160 horsepower engine will run you, on average, $36,6332 to buy outright. If you take out a loan, you must factor in the monthly interest. According to a Cherokee owner, the cost of a private pilot insuring a Piper Cherokee is a minimum of $800/yr. An annual (each year, airplanes must undergo annual inspections) costs around $1,500-2,000 (we’ll go with $1,750), oil will cost you about $2/hr, and the fuel burn is about 6 gph at around $5.03/gallon. Additionally, you’ll have to consider hangar or tie-down costs ($300/month or $60/month respectively), an engine and propeller overhaul (about $20,000 and $3,500 respectively), and any incidental maintenance3. So, if you happen to pay it all off in one year, it will cost you $64,690 to tie it down and maintain it. After it’s completely paid off, it will cost $28,057 a year to tie it down, fly it just 40 hours, and maintain it to minimum standards. The Aspen Flying Club in Colorado has a PA-28R (a Piper with retractable gear) that you can fly for $149/hr. This includes fuel. Additionally, you will be paying a $35/month membership fee, and a $100/year insurance cost. Given that you’re flying on average 40 hours a year, it will cost you $6,480 a year to fly. The Oxford Flying Club in Connecticut has a Cessna Skyhawk (an airplane of comparable performance and cost) that you can fly for $110/hr, which includes fuel. For membership in the club, you will be paying a minimum monthly membership fee of $333, which would include the club minimum of 2 flight hours ($199) a month and a monthly allocation fee of $135 (which includes insurance). In addition, to join the club, you would also pay a one-time fee of $500. So, the first year would cost $6,756 ($4,996 for the minimum fee, which would include 24 flight hours, $1,760 for the additional 16 flight hours, and $500 for the one-time fee), and $6,256 every year following. The High Sierra Pilots Flying Club was created with the goal of making aviation more accessible to everyone, from pilots without airplanes to pilots considering buying an airplane, to anyone who wants to learn to fly. Because of this, the insurance cost is included in the monthly membership fee of $250 for student pilots and FAA Wings Certified pilots (who are statistically safer pilots), as well as the cost of oil. The hourly cost for the 1965 Piper Cherokee 140-160 (meaning it has a 160 horsepower upgrade) is just $20 dry, meaning fuel isn’t included. Given the national average cost of 100LL Avgas, $5.03/gallon (I found this cost by taking six Avgas prices from across the nation and finding the average), and the Cherokee’s fuel burn of just 6 gallons per hour, the total cost hourly is about $50. If you fly 40 hours a year, you’ll only be paying $5,000 a year, which is a little under $14 a day. For a little more than the cost of a meal at your favorite fast food place, you can fly an airplane. How cool is that? Overall, the High Sierra Pilots flying club offers one of the most affordable options for private pilots. Pilots from Lake Tahoe to Reno, Carson City to Minden and beyond who can now save money and experience the many benefits of a flying club, which include camaraderie, educational and safety opportunities, as well as the chance for club members to advance their ratings as we add more aircraft to our fleet. If you’re looking for aircraft for sale near Reno, Minden, or the Tahoe area, the High Sierra Pilots Flying Club offers a strong alternative. Next, we’ll discuss the benefits of flying clubs for the student pilot! 2 – I took the average purchase cost of 6 different PA-28 160’s for sale on Controller, Barnstormers, and Trade-A-Plane and averaged them.